Geek Calligraphy has been around for a little over two years now. We've been putting out a blog post every week for most of that time, spent the first six months putting out a product every other week, and the remaining 19 months putting out one product per month. Put simply, this schedule is kinda burning us out. This has been complicated by Terri's schedule being eaten by snow days keeping Monster out of school, the rest of her time being taken up dealing with IRS *ahem* tomfoolery with our new EIN since we incorporated, and Ariela's day job suddenly requiring a bunch of unanticipated overtime. Life happens. We had hoped to come out with a "Here's our new schedule!" announcement, but for now, we'll be blogging as time allows and re-running some of our past favorites other weeks. The next product release will come when it comes. Thanks for bearing with us while we get this figured out. 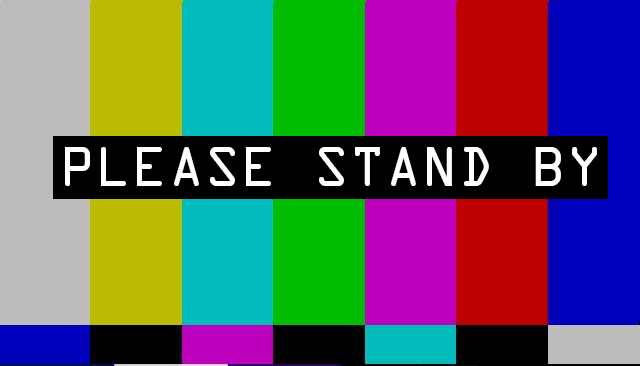 Test pattern with "Please Stand By" written over it. To inform you that things are going to look a little different around here. When we launched, it was with a new product release every other week. Ariela had a bunch of greeting cards on deck, and the other products on our schedule didn't seem too much. Fast forward a few months. We've added 2 professional oaths, several greeting cards and a ketubah to our product line. Ariela has stopped talking to me about how magical and wonderful art is. * She went to WisCon, and ran up against a project she really wanted to have ready in time. So it was time to have a reality check. Slowing down was in order. As friends who are business partners, sometimes there is a push-pull that you have to walk very carefully. When your best friend is creative and driven, sometimes you have to talk her down from the ledge. It's easier with me - when I get startitis, I end up with several more in-progress projects, but I'm not tearing my hair out, nor is knitting making me unhappy. When Ariela has an attack of "Be Productive," it can end up with too many things on her plate at one time. So we're clearing the plate some. Starting this month, we'll be ratcheting down to one product release a month. ** This should hopefully give Ariela room to do her scribal practice, the occasional commission, Geek Calligraphy products AND her day job. If that works successfully, we'll stick with it. If it doesn't, we'll revisit it in a few months. *That sounds fluffy and silly, but when Ariela is happy with her art, she is talkative about it.